One of Oregon's best known and most respected poets. 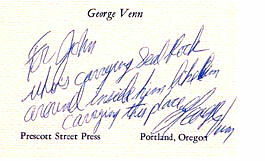 Venn is an Emeritus Professor of English and Writer-in-Residence at Eastern Oregon University. He is also a recognized essayist and translator.